We’d love your help. Let us know what’s wrong with this preview of The Black Orchids by Carol Van Atta. Will their prayers move Heaven's Heart before it's too late? When Ted Lyons accepts the new pastorate at Cherry Creek's Community Church, he has no idea just how handy his former law enforcement skills will become. A murdered pastor, the pastor's kidnapped wife, and their runaway daughter are only the beginning in a series of problems he wishes were part of a bad dream. Ted Will their prayers move Heaven's Heart before it's too late? When Ted Lyons accepts the new pastorate at Cherry Creek's Community Church, he has no idea just how handy his former law enforcement skills will become. A murdered pastor, the pastor's kidnapped wife, and their runaway daughter are only the beginning in a series of problems he wishes were part of a bad dream. Ted soon realizes he's facing a battle better fought on his knees, in prayer, than with his gun. As ruthless demons, summoned by an international cult - The Black Orchids - take over the town of Cherry Creek, angelic warriors are dispatched to protect the weary residents and stop a diabolical plan of destruction. By surrendering their lives to God and forming an unlikely alliance, Ted and a rag-tag group of struggling believers work together to slay the shadows of evil that threaten their very existence. To ask other readers questions about The Black Orchids, please sign up. Sometimes you come to expect a certain level of writing from an author. I always find it amazing when the author not only meets, but also exceeds your expectations. Van Atta does that with this novel. It was an epic journey that you can’t help but fall in love with. This novel takes Christian fiction to a whole new level in an amazing way. Van Atta manages to tactfully bring the voice of God to the forefront of her story without it becoming “preachy”. You never feel that she is trying to convert Sometimes you come to expect a certain level of writing from an author. I always find it amazing when the author not only meets, but also exceeds your expectations. Van Atta does that with this novel. It was an epic journey that you can’t help but fall in love with. This novel takes Christian fiction to a whole new level in an amazing way. Van Atta manages to tactfully bring the voice of God to the forefront of her story without it becoming “preachy”. You never feel that she is trying to convert her readers, but rather, to tell the story of a battle waging in a small town. Individual choice and freewill always plays into people’s actions. You can see the influence of angels and demons in the world, but they do not force individuals or their actions. They simply guide them on their journeys. She puts peer pressure in a much grander scheme of things with this. Van Atta uses descriptions that bring absolutely everything to life in a very big way. Everything was so clear and approachable (well.... if it wasn’t evil, that is). The writing style in this novel suits the storyline perfectly. You can’t help but be drawn in through her way with words. Also, Van Atta regularly flips perspective and scene from character to character within chapters. Through this technique, she manages to increase the depth of the novel while maintaining a very clear flow to the story. Everyone remains separate while working together to form a complete story. Even though a great deal of the characters aren’t human, they are all so well developed, both in physique and personality, that you can’t help but relate to them, or at the very least picture them in your mind’s eye. Every character evokes a reaction in you as a reader. Some you want to help, some you want to hold, and others you want to beat over the head with a pillow until they realise how ridiculous they are being. It is the perfect cast for this novel. As a cohesive unit, this story was at times disturbing, but always brilliant. You cannot help but be drawn in, wanting to continue on with the characters as they battle the forces of the underworld. One thing that came out of this novel for me??? I definitely do not want to travel to this town. I don’t think that I’d have the willpower that the characters do, or the ability to resist. 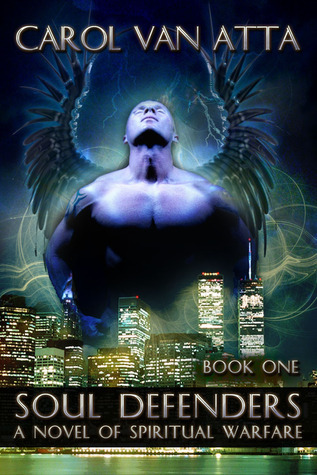 Soul Defenders is about one small town called Cherry Creek and it's battle in spiritual warfare. Many of the key players through out this book faced personal attacks from Evil One against their faith~Lily Howard faced more than most of key players. Lily soon to be sixteen will face many trials and testing of her faith in ways she does not expect or forsee either. Lily's guardian angel Argentio believes that his charge will come to see God's goodness and grace for herself~it's only a matter of ti Soul Defenders is about one small town called Cherry Creek and it's battle in spiritual warfare. Many of the key players through out this book faced personal attacks from Evil One against their faith~Lily Howard faced more than most of key players. Lily soon to be sixteen will face many trials and testing of her faith in ways she does not expect or forsee either. Lily's guardian angel Argentio believes that his charge will come to see God's goodness and grace for herself~it's only a matter of time and faith. Rose Howard sees Lily falling away from her faith and becoming angry with God. Rose prays for her daughter yet struggles to understand why her husband Bill's spiritual journal has lies straight from the pit of Hell itself. Pastor Ted Lyons feels that God has called him to Cherry Creek for a purpose he yet doesn't understand but trust in God's timing and plans. When he faces spiritual attacks he realizes this tiny town is in the grips of spiritual warfare. He needs to call on his old friend Jimmy Johnson for his help because this battle will need all of his faith and spiritual guidance. Karen White has been called by God to be a spy at the compound where The Cause is located. Karen seeks God's face to bolster her spiritual defenses. Will Lily come back to God? Will Rose trust in her faith? Will Pastor Ted Lyons accept his place in coming spiritual battle? Will Karen's faith remain strong? What can Jimmy Johnson do to help Ted? Your answers await you in Soul Defenders:The Black Orchids. A thrill-packed ride with unexpected twists, “Soul Defenders: The Black Orchids” is a riveting novel that is soundly evangelical and Bible-based. In the small, seemingly sleepy and peaceful community of Cherry Creek, Oregon, nestled in the shadow of Mount Hood, a battle rages above and beyond the earth, a battle between God’s angels and Satan’s demons, a battle for minds and souls. A murdered pastor, an evil detective, a mysterious cult with Satanic intent, and devoted prayer warriors are just part of the scene. A new pastor is called from Southern California and pits his prayers and beliefs against the demonic intent for this town, and against the Master Plan set in motion to destroy all the good of Cherry Creek for eternity. Author Carol Van Atta writes excitingly of the unseen battle, comfortably interweaving the spiritual background and the need for prayer to repel the demonic forces. Her characters are realistic and understandable, well-rounded individuals who stand at, or have stood at, decision points. Free will is an important concern here, as each individual must decide whose side to choose, and to accept the consequences. Nothing comes easy, but then this is war-spiritual warfare-and the stakes are high. I really enjoyed reading this book. I found it to be very exciting . Its a biblical based supernatural thriller , which was an awesome combo. It's about a small Christian town that's being over run by a cult and the battle between good and evil for the citizens souls. Much of the battle is internal and unseen . Morals and prayer, two things that one can not see , play important roles in the battle to save the lives of this small town. loved this book can't wait till the next one, Thank you, Carol for this wonderful book. The Battleground? Cherry Creek; a quiet small town. What on earth could be happening there? Only demons, a murdered pastor, kidnappings, torture, demonic harassment,and an international old evil; The Black Orchid organization. There's a plan to unleash evil on a level never before experienced anywhere and to cause it to spread worldwide; and Cherry Creek is their base. Not to worry there are angels dispatched to protect believers and intervene as they pray and as God directs. Ted Lyons comes to The Battleground? Cherry Creek; a quiet small town. What on earth could be happening there? Only demons, a murdered pastor, kidnappings, torture, demonic harassment,and an international old evil; The Black Orchid organization. There's a plan to unleash evil on a level never before experienced anywhere and to cause it to spread worldwide; and Cherry Creek is their base. Not to worry there are angels dispatched to protect believers and intervene as they pray and as God directs. Ted Lyons comes to town as the new pastor of Cherry Creek Community Church, and then things really begin to heat up. An edgy and intriguing read! I enjoyed this book immensely! It was a welcome change from most Christian fiction. By that I mean it dealt with topics that tend to be shied away from by Christian authors, making it feel more true to life. The way the author conveyed the spiritual battles and interaction between the angels and demons was particularly interesting. An overall great book, with few typos, interesting characters, and some scintillating twists! I hate overly predictable stories and Carol An edgy and intriguing read! What a great great book. Wow....a must read. Surely a life changing book. Please read, you will not regret it. Simple but hey complex theme. H As an Author, I could be considered "genre-confused."